We say good bye to Veranna today and head out on the first leg of our bus tour. It was amazing to see Mauro, our driver, navigate these tiny roads with what turns out to be a very comfortable bus. We headed out quite early after breakfast for the trip to the Dolmites. A couple of hours in we made a bathroom stop at an AutoStratta which is sort of like a truck stop but not really. One can get their cappuccino and a fresh pastry along with wine and cheese and all sorts of snacks. They are really quite something to behold. 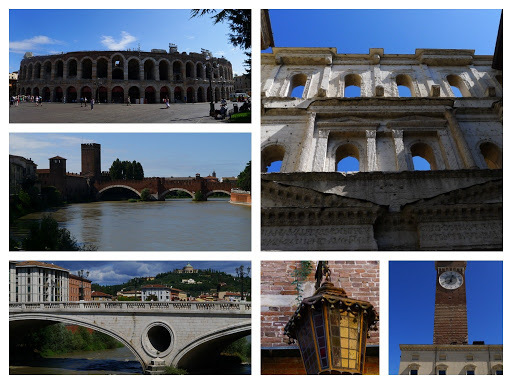 After a quick stop we made our way to Verona. Quick. What is Verona famous for? Come on you know&8230;. 1) Veronna is the setting for Shakespeare’s Romeo and Juliet. 2) Dante (yes that Dante) was exiled from Venice and lived the last 20 years of his life in Verona. We had an hour walking tour with a local guide who pointed out some of the highlights of this city of 250,000 people. Lots of Roman influence as you can imagine. She mentioned that they plant cyprus trees beside cemeteries because the root systems are very shallow and don’t disturb the remains of those who have passed away. She covered a lot of ground in the hour and it was nice to hear about the history and culture of the city. At 3:00 we hopped back on the bus and headed up into the Dolomite mountains where we’ll be spending the next two nights. It’s spectacular. It reminds me a lot of the Canadian Rocky Mountains but much more refined and civilized. Lots of mountain huts with fancy restaurants, ski lifts and gondolas everywhere to get around, it would be quite interesting to see in the winter time. The area feels very much like what I would think a German, Swiss or Austrian area would feel like. Alpine style houses, very germanic looking. This area used to be part of Austria before the first world war and has fought long to keep it’s cultural identity. We had a four course dinner tonight that was fantastic. Very Germanic in nature. Salad, soup, a very tasty pasta course, slow roasted beef with spetzle and apple strudel for dessert. We’re planning on doing a hike with a local guide tomorrow so that should be fun and good timing given the dinner that will need to be worn off.